I’ve given up on bread made from white rice flour. It’s disgusting and depressing. But for whatever reason, waffles and pancakes made from white rice flour are absolutely delicious. So why fight it? Embrace the waffle. It’s also important for us FMers, I believe, to diversify our meat intake, since our options are so limited. There are plenty of other meats out there other than beef, chicken, and pork. Which is why I’m using bison for this recipe. The taste is different from beef but still similar, and it’s much healthier for you. It contains fewer calories, and more beneficial nutrients that you need.The downfall to buffalo meat is that it’s a bit more dry than beef, which is why I included the lemon mayo that I found in Glamour Magazine. Heat your waffle iron to medium heat (I bought this one from Rome, although I wish I had gotten the one with longer handles because they get really hot). Mix together the Bisquick, protein powder, water, 3 tablespoons of olive oil, dextrose, and the egg, until there are no more lumps. Grease both sides of your waffle iron and add batter. Heat 1 tablespoon of olive oil in a pan over medium heat. Form buffalo meat into 4 evenly-sized patties. Cook patties for 6-7 minutes on each side. Mix together egg yolks, mustard, canola oil, salt, and lemon juice until well combined. 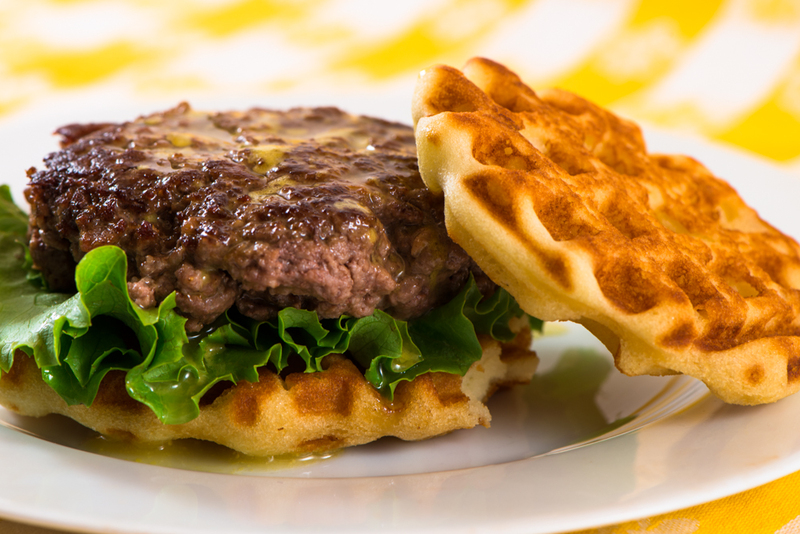 This entry was posted in Recipes and tagged bison burger, buffalo burger, dairy free, FODMAP, fructose malabsorption, lemon, waffle by nosugarlessgum. Bookmark the permalink.